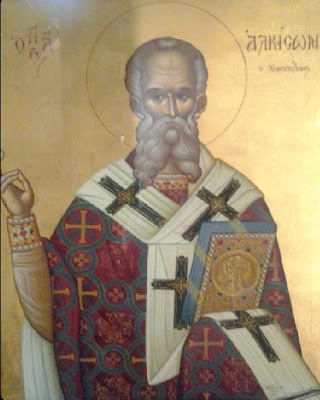 Saint Alkison was Bishop of Nicopolis (now Preveza) in Epirus from 491 to 516, and became a valiant opponent of the policy of accommodation with the Monophysites pursued by the Emperor Anastasios I (495-518) and his successors. He firmly resisted every attempt at persuading him to condone heresy and was imprisoned at Constantinople, where he died of the effects of ill-treatment, on 28 September 516. Around 460, the three-aisled basilica B Alkison was built, the first of a series of six in Nicopolis. Basilica B was the largest of the Nicopolis basilicas and probably served as the bishop’s cathedral church. An inscription informs us that Bishop Alkison (491-516) sponsored some additions to the southern annex of Basilica B, possibly around 500. It came to be known as the Basilica of Saint Alkison, the ruins of which still exist. The Synod of Chalcedon did not bring a definitive end to the theological disputes in the Church as a whole. In 482, Roman Emperor Zeno (474-491) promulgated the Henotikon, a declaration of union, written up by Patriarch Akakios of Constantinople (471-489) in a bid to bring compromise through reconciliation to the Monophysites of Egypt and Syria and the Duophysite of Asia Minor, Thrace and Illyricum, including Epirus. Pope Felix III (483-492) of Rome vehemently opposed the declaration because it did not explicitly endorse the principles of Chalcedon and in his view it represented an attempt to supersede the primacy of Rome in theological affairs, so in 484, he convened a synod, excommunicated Patriarch Akakios who, in turn, excommunicated him. Nevertheless, the Henotikon reconciled the Monophysites of Egypt and Syria to Constantinople and secured a certain measure of ecclesiastical peace in the east for thirty years. The price, however, was a dispute with the papacy, opening a schism between Constantinople, on the one hand, and Rome and those eastern provinces rejecting it, on the other, lasting until 519. During this period the bishops of Thessaloniki generally sided with the patriarchs of Constantinople, thereby breaking with the bishops of Rome and ceasing to act as their vicarii in Illyricum; meanwhile the popes did what they could to maintain communion with and the obedience of certain groups of provincial bishops in the praefectura through bilateral relationships, defending the rights of the metropolitans and their synods against interference from Thessaloniki and Constantinople: there had already been some tradition of such direct bilateral relationships going back to around 450, with the bishops of Nicopolis, the third see of Illyricum, sometimes playing a leading role. Emperor Anastasios (491-518) maintained a compromise position during the first half of his reign. But in 509, under pressure from Monophysite groups in Constantinople and Antioch following the end of the war with Persia (502-506), Bishop Flavianus II of Antioch explicitly condemned the Synod of Chalcedon and the Tomus Leonis, paving the way for Emperor Anastasios to give fuller support to the Monophysites in the east, leading to a period of depositions of pro-Chalcedonian bishops in Constantinople itself as well as throughout Asia Minor, Syria, and Palestine. Meanwhile, some 40 bishops of Illyricum supported the pro-Chalcedonians, maintaining constant correspondence during the ensuing years with Bishops Symmachus (498-514) and Hormisdas (514-523) in Rome, led by Bishop Alkison of Nicopolis, often defying the bishop of Thessaloniki. By 513, the conflict spread to Thrace where the comes foederatorum Vitalianus, also a supporter of the pro-Chalcedonian cause, revolted, followed by a large number of Bulgars and other Huns. In 514, Vitalianus and his troops took control of the northern provinces of the diocese and besieged Constantinople demanding, among other things, the recall of Chalcedonian bishops expelled from their sees and the convening of a synod at Herakleia in Thrace to effect an ecclesiastical union with the participation of all the bishops, including the Bishop of Rome Hormisdas. Under pressure, Emperor Anastasios agreed and Vitalianus lifted the siege. In preparation for the synod, in 515 Bishop Hormisdas made a pact with the 40 bishops in Illyricum by which they withdrew from communion with Bishop Dorotheos of Thessaloniki. In the meantime, Bishop Alkison of Nicopolis traveled to Constantinople where he signed a libellus of reconciliation brought by Roman legates and he served as intermediary between the Roman see and the monks organizing the Chalcedonian supporters in Palestine. However, the Emperor delayed implementation of the agreement to hold the synod. In reaction, Vitalianus again besieged Constantinople by land and sea, but the Imperial forces defeated those of Vitalianus who was forced to retreat. In retaliation, Anastasios removed him as magister militum per Thrace. At that point, in the spring 516, the Emperor finally convened a synod at Herakleia in Thrace, gathering more than 200 high-level clergymen, but the actual synod never took place: instead Emperor Anastasios, with the active cooperation of Bishop Dorotheos of Thessaloniki, acted against the group of forty Illyricum bishops opposing them, forcibly bringing the bishops of Nicopolis, Lychnidos, Serdica, Naissus, and Pautalia back to Constantinople. There Bishop Gaianus of Naissus died in prison. Emperor Anastasios released two other bishops from Dacia Mediterranea, for fear of losing the Illyricum army’s support. But Imperial agents also arrested Bishop Laurentius of Lychnidos and Bishop Alkison of Nicopolis, who died in prison in September 516. Pope Hormisdas received a letter in 517 from the Bishop of Nicopolis, calling Bishop Alkison "our holy father Alkison." Only very recently, since 1988, has the Ecumenical Patriarchate recognized Bishop Alkison of Nicopolis as a saint for his martyrdom, thanks to the investigative efforts of the current Bishop Meletios of Preveza/Nicopolis. 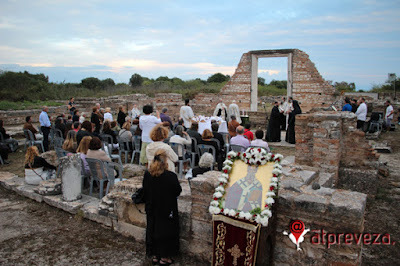 In 2013, for the first time in around 1500 years, Metropolitan Chrysostomon of Preveza/Nicopolis held a Divine Liturgy at the ruins of the Basilica of Saint Alkison in Nicopolis. The efforts and sacrifice of Saint Alkison of Nicopolis and other bishops of Illyricum proved not to be in vain when Emperor Justin (518-527) and his nephew Justinian (527-565), also themselves Illyrians from the province of Dardania, Dacia diocese, came to power backed by those in favor of the orthodox Dyophysite, pro-Chalcedonian policy, paving the way for reconciliation with Rome under Bishop Hormisdas.